Kittens should be weaned at fourteen weeks. The current recommended weaning age is twelve weeks. I am told that kittens can be weaned as young as eight-weeks-of-age in the United States. Early weaning increases aggression and stereotypic behaviour in cats. Early weaning therefore can cause cat behavioural problems. These include, shyness, stereotypic wool sucking, aggression and excessive grooming. A lot of people have heard about Pica which is another example of a cat behavioural problem possibly caused by early weaning. Sucking on their human companion is another example. A new study from Professor Hannes Lohli’s research group conducted at the University of Helsinki reached the conclusion that the current recommended age of weaning of twelve weeks should be extended by least two weeks. They concluded that this would be a very cost-effective and easy way to improve the quality of life of domestic cats. Doctoral student Milla Ahola says that to raise the age of weaning to 14 weeks would be the “animal welfare act of the year”. I think that the scientists who conducted the study believe that early weaning may cause behavioural issues beyond those which are generally accepted and therefore why not extend weaning by two weeks to protect against these possible lifelong problems. An extensive database concerning 6,000 cats was utilised in the study. The survey/study decided that many behavioural problems are more common than might be expected. They say that more than 80% of cats in the study were reported as having mild behavioural problems. Serious behavioural problems were reported in a quarter of the cats. Cats weaned at or under the age of 8-weeks-of-age displayed more stereotypic behaviour and aggression. When cats were weaned at adulthood they exhibited fewer such problems and cats weaned at fourteen weeks of age had fewer behavioural problems than those weaned earlier. Increased aggression correlated with stereotypic behaviour. Weaning: I believe that in this instance weaning means to be removed from the mother’s care and become technically independent and to enter into the care of a human being who has typically bought the kitten. This entry was posted in socialisation and tagged Bad Cat Behavior, cat behavior, socialisation, weaning kittens by Michael Broad. Bookmark the permalink. My two Tabbinese Tigers were weaned from mama by necessity at 3.5 weeks. While I bottle fed they also had a surrogate mama in our Little Mercy. Young cats can thrive but there should be at least two and an adult cat in the home to nurture them. I stopped weaning my last foals at 3 months to prep them for halter classes and left them with mama. She weaned them naturally at 9 months even though they were only suckling once or twice a day at that point. It’s becoming a more evolved trend in breeders to not only try and breed high quality and temperament but respect the emotional value of being left with their mother for a longer more natural period of time. I think New Mexico is one of the most beautiful places I’ve lived. I sold the last of my horses a few years ago. The stresses caused by early weaning are not replaced by formulated nutrition or the nurturing given by the dam. I have seen the same behaviors when we had the feral colony. Many breeders are in it for the money and the sooner a baby animal is weaned the sooner the female can be rebred and produce more. With horses a foal sold at 3-4 months as a halter prospect has little overhead beyond breeding and vet fees. The well developed emotionally developed foal sold at 9-12 months has a feed bill, farrier and vet costs attached. Considering the number of behavior issues I’ve seen in horses and the shelters full of cats and dogs turned in because they were unstable you have to start to look at not only poor breeding but poor environmental conditions. 8 week old puppies and kittens are not equipped to deal with life on their own. 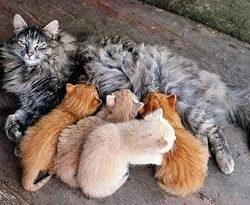 I feel its up to Mom when she feels her babies should be weaned. Correct but breeders don’t allow this. That’s not true of US breeders. I don’t know about English breeders. Here, breeders will not force weaning or other natural feline social development. Weaning is up to the queen and the kit’s needs. I do like the idea of not releasing kits until 14 weeks. Unfortunately, shelters and the lesser rescues are all about selling kits at 6-8 weeks age, therefore are the primary reasoning behind weaning and separating kits from their mums long before it’s healthy to do so. How this gets blamed on breeders is beyond me.